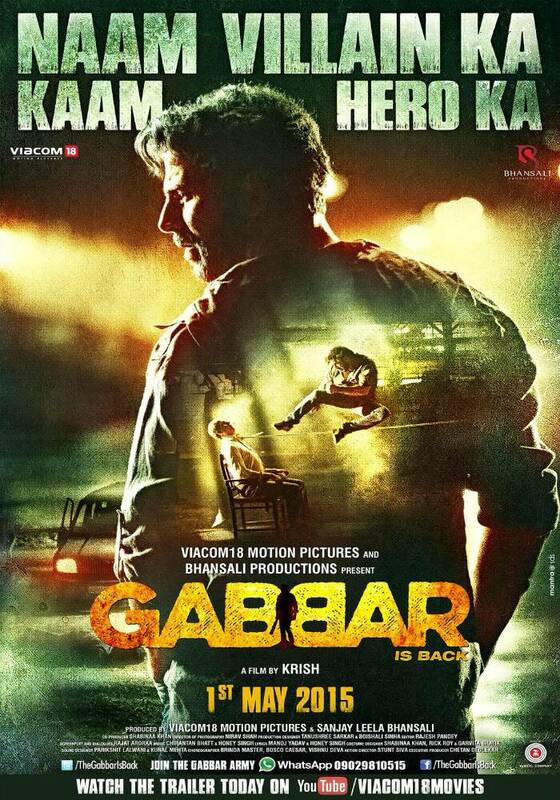 'Gabbar is Back' poster is a full-length shot of Akshay Kumar's back with a side profile of his rugged face. In the film, Akshay Kumar plays the role of a ACP Ajay Singh Rajput/Gabbar. While the first poster of Sanjay Leela Bhansali’s production, ‘Gabbar is Back’, featured the hard hitting message, ‘Corruption is dead’, the new poster gives us a glimpse of the man behind the action – Akshay Kumar. Bearing the punch line, ‘Naam Villain Ka, Kaam Hero Ka’, the poster is a full-length shot of Bollywood Khiladi Akshay Kumar’s back with a side profile of his rugged face. The poster also features a shot showing Akshay in mid-air, while delivering a high-flying kick. In the film, Akshay Kumar plays the role of a ACP Ajay Singh Rajput/Gabbar, who becomes the leader of a vigilante group in the city, out on a deadly mission, that is to end corruption. Directed by Krish, ‘Gabbar is Back’ also stars Shruti Haasan, Prakash Raj, Sonu Sood, Nitin Dheer and Kareena Kapoor among others.